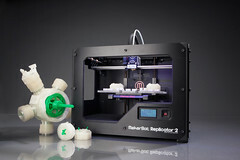 Are 3D Printers Worth Buying Yet? This question was answered on December 9, 2015. Much of the information contained herein may have changed since posting. While it’s not hard to understand why 3D printers are considered a disruptive technology, it’s far from being a mainstream product. The answer to your question depends greatly on who you are and what you might want to do with a printer that can generate solid objects in three dimensions. Their are certainly more business use cases than consumer use cases, but if you’re the type that loves tinkering with new tech, it’s getting much less expensive to take the plunge. One of the current industries being disrupted by 3D printers is manufacturing, because the prototyping process just got much easier. In the past, you had to be a well-funded organization that could afford the expensive and time-consuming process of developing prototypes. With 3D printers, virtually any size company can participate in do-it-yourself prototyping and production. On the consumer side, there are countless items that you could print at home with a 3D printer, so the question becomes is it worth your time. Another thing that makes them more approachable are platforms for sharing 3D modeling ‘recipes’ at sites like http://Thingiverse.com and https://YouMagine.com. You no longer have to be a design engineer with really expensive software in order to take advantage of 3D printers – you can simply download the designs created by others. Common household items like cups and bowls, food clips, lamps, toys, smartphone cases, camera tripods, desk organizers or just about any small plastic item you have in your house can potentially be printed. Keep in mind, just like with traditional printers, the real costs of owning a 3D printer are the consumables. Instead of ink, you will have to buy spools of special plastic filament in various colors and when you make a mistake, you can waste a lot of the printing filament. Lower priced 3D printers can only print in one color at a time, so more complex multi-colored items can only be generated from much more expensive printers. As this is an emerging technology, I’d only suggest buying your own printer if you’re the type that likes playing with ‘bleeding edge’ technology with the full knowledge that something faster, cheaper and better will be available right around the corner. A better way to dip your toe into this pool is to try out on-demand 3D printing services like http://shapeways.com. You can choose one of their designs or upload your own and they will use their much better industrial grade printers and ship it to you for a fee. At some point in the future, the eco-system for 3D printers may be mature enough that you can find cheap, multi-colored printers and downloadable designs for just about anything in your house. Until then for most people, it’s really an expensive ‘erecter set’ for the tech savvy crowd.